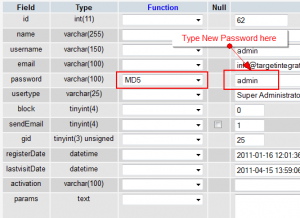 Today, I want to write about Change the Password Directly from Database on Joomla 3.4 Hosting. First, If the admin user is already defined, the best way is to vary the password within the database to a known password. This method requires that you just have direct access to the MySQL database using phpMyAdmin or another client. Following steps show how to manually reset a password to the word - "Admin"
1. Open phpMyAdmin and choose the database of your Joomla web site. On the Left Top side of the dropdown list will appear. It'll show all the database tables. 2. Find a table " prefix_users" in the list of tables (note: prefix can depend upon your prefix value.). 3. Click on the "Browse" button in the top toolbar. it'll show all of the users for this web site. 4. Click on the " Edit icon " for user whose word you would like to change. into the password field and press the Go button. 6. Log in with this user and password (Admin). 7. Then, after you logging again, change password from user Manager for this user. 8. Now, Select all of the users in User manager and also modify the password of others if your website was hacked. Today, I will show you how to manage product attributes in PrestaShop 1.6. Attributes on PrestaShoip are the basis of product variations. You can only create variations of a product if at least one of its attributes changes and you can add multiple attributes. 4. Then, Click Save. You're getting to see the attribute you only added in the list. 1. On Catalog select Product Attributes, then click Add New Value. Attribute group: Select the type of the attribute, example: Color, etc. Value: The name of the value itself, for instance for Color. Meta title: The Specific format for your meta title. Color: You can Select a color with the color picker, or enter an HTML color code. Texture: Upload color texture from your PC. 4. Click on Save button at the bottom right or Save then add another value to feature additional values. 5. 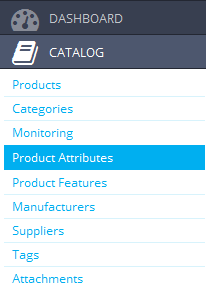 You may see all the values you added if you click Edit button for the attribute you added the values to under Catalog -> Product Attributes . You'll additionally edit or delete them from there. Here are some tips and tricks you'll be able to use for Umbraco 7.2 CMS related developments. You'll be ready to use the following techniques to organise your Umbraco page URLs. This is the most common method for us to return a "Friendly URL" for a given node within the Umbraco content section. As explained in Umbraco, a 'Friendly url' is the complete encoded URL excluding the domain. however this relies on the settings you tack in UmbracoSettings.config file. If you set useDomainPrefixes=true in UmbracoSettings.config, NiceUrl returns the url as well as the domain. Things to note: you must perpetually use umbracoUrlAlias field value in lowercase letters, not use a leading slash and not use a trailing ".aspx". SQL 2014 is a great release from Microsoft and in this post I will describe information about Buffer pool extension in SQL Server 2014. In previous article, we have anylize new feature in SQL 2014. As you know, the Buffer Pool is one of the main memory consumers in SQL Server. When you read data from your storage, the data is cached in the Buffer Pool. SQL Server caches Execution Plans in the Plan Cache, which is also part of the Buffer Pool. The more physical memory you have, the larger your Buffer Pool will be (configured through the Max Server Memory setting). A lot of SQL Server customers are dealing with the problem that physical memory is restricted in database servers: all memory slots are already occupied, so how do you want to add additional memory to the physical server? Of course, you can migrate to a larger server, but that’s another story… The solution to this specific problem is the introduction of Buffer Pool Extensions in SQL Server 2014. The Buffer Pool Extensions itself are only used if the Buffer Pool of SQL Server get’s into memory pressure. Memory pressure means that SQL Server needs more memory than currently available. In that case the Buffer evicts pages from the Buffer Pool, which were least recently used. SQL Server uses here a Least Recently Used Policy (LRU). If you have now configured an Extension File, then SQL Server will write these pages into it, instead of writing them directly out to our slow storage. If the page is a dirty one, then the page will be also concurrently written to the physical storage (through an asynchronous I/O operation). Therefore you can’t loose any data when you are dealing with the Buffer Pool Extensions. At some point in time your Extension File will be also completely full. In that case SQL Server has to evict older pages from the Extension File (again through a LRU policy), and finally writes them to the physical storage. The Extension File just acts as an additional layer between the Buffer Pool and the storage itself. Buffer pool extension size must be larger than the current memory allocation threshold 1596 MB. Buffer pool extension is not enabled. The next restriction that you will definitely hit is that you can’t change the size of the Extension File during the runtime of SQL Server. For example, when you want to change the Extension File to a larger size, you have to disable the Buffer Pool Extensions, and re-enable them again. You will have of course a performance degradation in the time of this operation, because you are just disabling one important caching layer used by SQL Server! Be aware of this fact, when you are planning a deployment of the Buffer Pool Extensions for your production environment!!! Buffer pool extension size must be larger than the current memory allocation threshold 4096 MB. Buffer pool extension is not enabled. The whole configuration of the Buffer Pool Extensions can be also retrieved through the Dynamic Management View sys.dm_os_buffer_pool_extension_configuration. When should you use the Buffer Pool Extensions? Microsoft makes the recommendation that your workload should be write-heavy, e.g. a OLTP workload. You should not have a look on the Buffer Pool Extensions, when you are dealing with a DWH/BI related workload – an Extension File doesn’t make sense here. And when we are talking about the Extension File itself, you should spend a very fast SSD for it! Traditional rotational hard disks are a No-Go for it! Previously, we have discussed about new features in SQL 2014. Now, in this article, I will discuss further about SQL 2014. What’s more interesting in newest SQL 2014? You can specify an SSD (or an SSD array) to be used to extend memory. SQL Server 2014 will automatically cache data there with zero risk of data loss. (Only clean pages, not dirty pages, are stored there.) The best use case is for read-heavy OLTP workloads. This works with local SSDs in clusters, too – each node can have its own local SSDs (just like you would with TempDB) and preserve the SAN throughput for the data and log files. If you really need to scale out your reads, SQL 2014 gives you up to 8 secondaries (up from 4). Of course, you’ll be paying for Enterprise Edition licensing on these, but if you were already going to replicate data out to various reporting or BI servers, now your life is easier. In SQL 2012, if your primary drops offline or the cluster loses quorum, the readable replica databases drop offline. In SQL 2014, the secondaries remain online and readable when the primaries aren’t available. However, keep in mind that typical AlwaysOn AG connections go through the AG listener name, and then fetch the list of readable replicas from the primary. This just means that in order to keep your report queries online, you can’t use the AG listener – you have to connect directly to the replica’s server name. I like using a separate set of DNS records for readable replicas, like readonly.mydomainname.com, and have my report servers point at those. With regular volumes, only one node can own the volume at any given time. He owns the entire volume, and no other node can see/read/write files on that volume. However, Windows Server clusters have a type of drive volume called Clustered Shared Volumes with much more flexibility. Multiple cluster nodes can be connected to the same volume at the same time, but each node can access different files on the drive independently. Windows and Hyper-V have supported this for a while (see the BOL section on the benefits), and now SQL Server supports it too. The big benefit here is that if one node of the SQL Server cluster loses connectivity to the storage, it can still read and write data over the network to a different node’s SAN connection. Any question about newest SQL 2014? Or want to test the new SQL 2014 feature? Looking for SQL 2014 hosting? Try us as your SQL 2014 hosting solution. Moodle 2.7.2 is a learning platform designed to provide educators, administrators and learners with a single robust, secure and integrated system to create personalised learning environments. 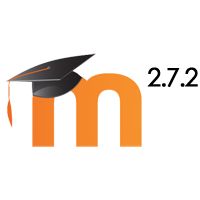 Moodle 2.7.2 is a free, open source learning management system developed by educators for educators. In this secure, password protected environment, faculty can upload documents, assignment instructions, links to web sites and media. Learning can be extended beyond the limits of a traditional classroom setting through chat sessions, discussions, collaboration spaces, quizzes, surveys and more. 6. For Multiple choices questions in the quiz / question bank, the options "Clear incorrect responses" and "Show the number of correct responses" did not make sense for "One answer only" questions. It is now impossible to select that combination of options on the form. How do I install Moodle 2.7.2 in hosting account? - You can install Moodle 2.7.2 manually by uploading the package to hosting account or simply use the auto installer in hosting Plesk Control panel. By using auto installer, you will get latest update notification if you install Moodle 2.7.2 via auto installer. How much should I pay for Moodle 2.7.2 hosting? - Depends your requirements, the shared hosting for moodle should be less than Є5.00/mo. If you need higher hosting requirements, we highly suggest you check out our page. How much server resource do I need? - Moodle 2.7.2 is a little server resource sensitive because the more course you add and the more users you have, the more server resources will be used. 100MB memory is needed for regualar moodle 2.7.2 site smooth running. PrestaShop 1.6 Hosting - HostForLIFE.eu :: How do I Change The Default Grid Settings on PrestaShop 1.6 ? On this occasion, I will explain you how change the default grid settings. In Prestashop 1.6, by default uses grid of 3 products at the category page and 4 products at the homepage. Here are the steps that you must follow. PrestaShop 1.6 is a free and open-source e-commerce web application, committed to providing the best shopping cart experience for both merchants and customers. It is written in PHP, is highly customizable, supports all the major payment services, is translated in many languages and localized for many countries, is fully responsive (both front- and back-office), etc.